Green tea is a beverage that contains hundreds of chemical compounds that all contribute to its appealing aroma and taste. Out of all these compounds, epigallocatechin gallate (EGCG) is responsible for the anticancer activity of green tea. Studies have shown that the development of many tumors is inhibited by EGCG because it has the ability to shut off growth-promoting genes. In addition, inhibition of blood vessel growth to the tumor is one of the key reasons why green tea is a great anticancer agent. EGCG may also have the ability to act as an antioxidant, seeking out and destroying free radicals. These anticancer effects are most notable in prostate and bladder cancers. Green tea undergoes the least processing of all the teas, and thus retains its natural anticancer activity as compared to black tea and oolong tea which do not have the anticancer properties. There is great variation in the content of EGCG between different brands of green tea; Japanese green teas generally contain higher amounts of EGCG. It is recommended that the tea brew for 8-10 minutes. Drinking a cup three times daily ensures that you are getting an adequate amount of the anticancer boost that green tea provides. 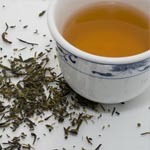 Research suggests that bottled teas and instant teas have less anti-cancer compounds, so a freshly brewed pot of green tea has the most potency.